Make sure you also read this post, where I studied the PAR of these lamps and realized they are not as good as I thought! 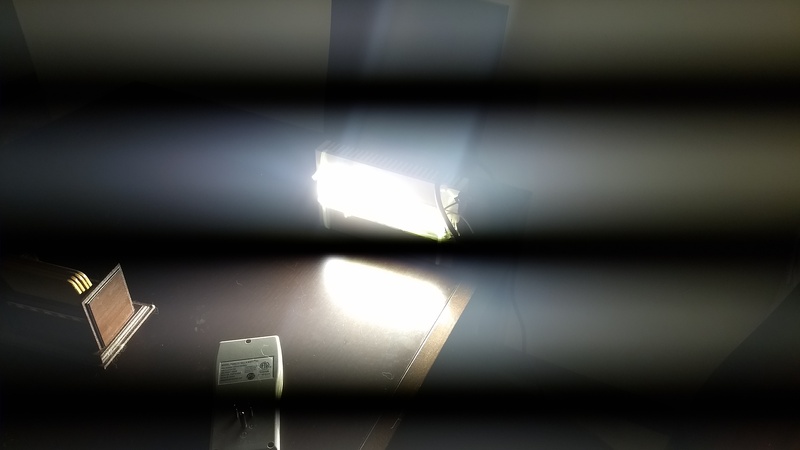 Several months ago I wrote a post about using high power LED cobs that do not require an external driver in order to build a high power DIY LED lamp. However I hadn't built a practical lamp using these cobs at that particular point in time so I just gave a general idea of why I would use these diodes and how the particular lamp setup would work. 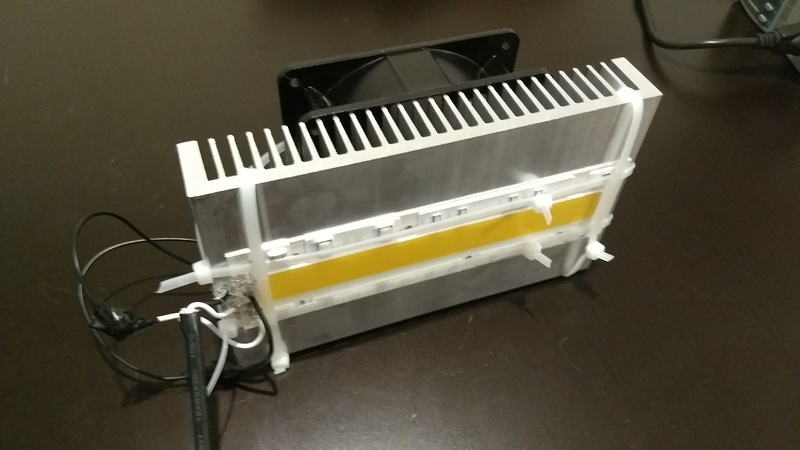 Today I want to talk about how to build one of these lamps in practice using an aluminum heat sink, a 150W warm white LED cob, a fan and some zip ties. The setup lacks the use of any adhesives and should provide you with roughly a 40-50% equivalent of a 1000W HPS. With two of these lamps you should be able to run the equivalent setup to 80-100% of a 1000W HPS in terms of PAR with around 60% less power consumption. The idea of this post is to help you build a very affordable DIY lamp. However please note that this lamp involves work with mains voltages which are dangerous. Please familiarize yourself with all the precautions needed when working with high voltages. All the information herein in is provided as-is for educational purposes with absolutely no guarantee, either expressed or implied. 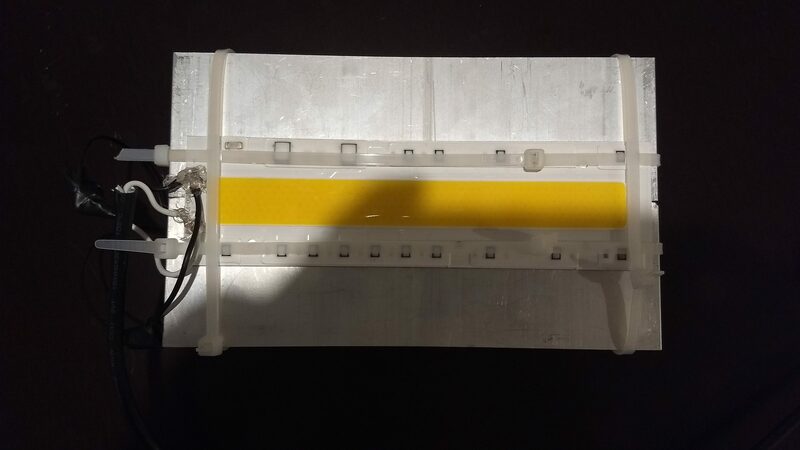 Initially I wanted to build a lamp using a high power warm white LED cob by gluing the cob to the heatsinks using a thermally conductive glue. However the problem with this is that these glues very permanently bind the cob to the heatsink so if for any reason the cob fails you would lose the heatsinks because the cob would be bound to them. For this reason I decided to use zip ties instead, which provide an easy way to secure the entire ensemble and allow you to easily replace any failing part rather quickly. I used nylon zip ties but you can also use stainless still ones if you want the setup to be more resilient (although things will be harder to cut if you make a mistake). To assemble the lamp I basically used 4 zip tie lines two horizontal and two vertical. For the lines that go the width of the heat sink I just had to use one zip tie but for the other two lines - that also go above the fan - I had to use two zip ties for each line (you can connect one zip tie to another to have a larger zip tie). You need to tighten the zip tie very hard to ensure the cob is in direct contact with the aluminum along all its length, you can also use some thermal compound (like the one you use for CPUs) between the cob and the aluminum heat sink for maximum heat transfer. The pictures below show you a bit better how I performed the entire assembly. When putting the fan on top of the heat sinks make sure the airflow is towards the heatsink (flow arrow in the case pointing down) and that the fan can spin freely). Finally I connected the cob directly to the AC line by soldering the appropriate live/neutral cables to the connectors at the left size of the cob (in the above picture). I then covered the soldered spots with silicon glue to ensure that the connections were as electrically isolated as possible. Make sure you solder as small portion of wire as possible and make sure the wire makes absolutely no contact with the aluminum heat sink or you will have a short. I also soldered the fan cables to the live/neutral as well since the fan can be driven directly by AC as well. Since you have the zip ties you can also use them to hang the lamp, you can also add screws to the fan screwing ports and use those to hang the lamp from the ceiling. When I turned on this lamp its power consumption was around 220W - measured directly from the wall - meaning that it consumed a bit more power than what was advertised (which is not uncommon for these cobs). Since my voltage is a bit higher than 110V - which is the minimum rating for this cob - I actually get a slightly higher light/heat output than someone using it at a lower voltage. The fan - which takes around 12-15W on its own, also contributes to this consumption level. When you power on this lamp - image above (sorry about the camera not being able to handle the light intensity) - you'll immediately notice how the heat sink starts to heat up. I have tested the lamp through 2 hours of continuous operation up until now and the heat sink reached a stable temperature of around the 120°C (~ 250F), the final temperature you reach will of course depend on your ambient temperature and how well you assemble the components. It is however very important for you to test each one of these lamps for 12/24 hours to ensure that they don't heat up excessively. Nylon will melt at around 220°C so you definitely don't want your lamp to ever reach even close to that temperature (to be safer you can use stainless steel zip ties). However it is very likely that the LEDs will burn out way before this happens if your temperature rises too far. You can also add a second fan or use a larger heat sink if your temperature is too high. In the end the setup is extremely simple to build and you can get roughly 40-50% of a 1000W HPS with one of these lamps. With two of these lamps you will run at around 450W which is 55% less power than an equivalent HPS setup. Although heat generation is no joke here, it is indeed much less than the comparable heat output of a 1000W HPS. With a cost of less than 80 USD per lamp you will be able to build these lamps at a far lower cost than the very expensive grow lights you can get online (which can often go for thousands of dollars for a single 1000W HPS equivalent). If you read my earlier post you will notice that I previously thought you needed 4 cobs to reach the equivalent of a 1000W HPS, turns out you only need two 110V cobs running at 120V! I have made some PAR, lux and temperature measurements but I want to keep those for a future post where we will look at some of the spectral and thermal characteristics of this lamp vs other lamp types. "If you read my earlier post you will notice that I previously thought you needed 4 cobs to reach the equivalent of a 1000W HPS, turns out you only need two 110V cobs running at 120V! " Yo have to provide PAR measurements data if you wrote something like above. I've mesured PAR for this LEDs and 600W HPS. From my calculation 1W of this LEDs = 1W of HPS when it comes to PAR. I'm using 50W LEDs, maybe these 150W are better, but i dont think there is so much differents. I will post the PAR/Lux info in a blog post soon! I'm looking forward to your new approach and wish you good look with that. 120°C heatsink temperature sounds terrifying to me. Low temperatures are necessary for a efficient led. If a good chip is too hot, it's not working efficiently. It's also bad for the life expectancy. See data sheets for that - the cooler the better. Less than ambient temperature is not possible and the cooling cost (heat sink size or air flow) for a gain in chip-temperature goes to infity to reach it. So it's clear that there is some kind of sweet spot depending on your preferences. 120°C is far to high for my gusto. Don't be that cheap (referring to initial cost) ;) Active cooling is another factor that's bad for the µmol/m/s²/W. Passiv cooling is the key and for that you need properly dimensionized heatsinks. Heatsinks are pricy in the beginning, but very durable. So in the end it's cheaper on the long run. 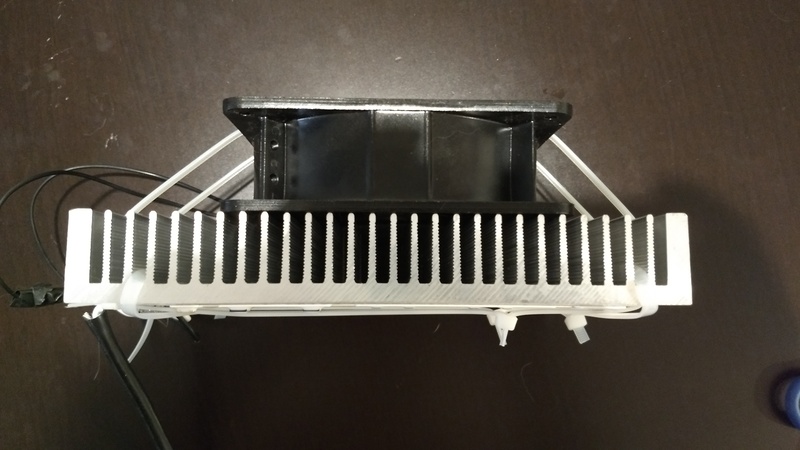 There is always a natural airflow because of the chimney effect - that can be well used in heatsink-design. Take a look at sanlight.info, if you don't already know it. Really nice design and incredible light. I don' know your "growing situation", but i have always well ventilated rooms - fans blowing lightly over the canopy. That also helps a lot with the temperatur (passiv cooling). An additional fan at the heatsink wont' help much in my case, if it helps at all. A properly sized heatsink is the key for temperature control. Fans are noisy and a waste of energy. Drivers are also an important thing to take a look at. Bad ones can have enormous losses. Meanwell drivers are a top variant, as far as I know. Actually there was an issue with the contact between the cob and heatsink when I did this test, after fixing it the temperatures - with the fan on top as shown - never exceeded 70°C. Without a fan it would easily kill the cob, the needed heatsink to run fanless would be huge (at least 4 times larger). Also these cobs do not require any external driver, they are connected directly to the wall at 120V AC, which makes them a very practical choice (which is my goal). They also make some specific cobs for growlights with this design, which is what I'm trying out next due to the very low PAR of this warm white light cobs. Something I’ve notice virtually everyone doing related to LED/HPS or MH debate is the fact that LEDs are a multipoint source whereas HPS/MH are single point. As a result of this there is no true equivalency. In professional studio lighting we use two basic types of lights, direct and indirect lighting. The distinction between the two is significant. HPS/MH lights behave as direct sources and LEDs act as reflected sources. As a result of this while the PAR or any other measurement does not take the characteristics of the two different types of light into account. The practical upshot of this is a lack of canopy penetration and a rapid decrease in the actual effective illumination level. Keeping in mind that light levels decrease exponentially as distance increases. I suspected this to be the case before I began my adventures in hydroponics. My girlfriend had a 1K HPS/MH lamp and batwing fixture and I purchased several different models and styles of LED fixtures. I didn’t intend to try and make a scientific study. As a result all my information is presented as strictly anecdotal. My observations followed these lines. The HPS/MH fixture had a tendency, as expected, to penetrate dense foliage and produce a higher intensity where it completely penetrated. It had an overall effective spread and as expected produce significant heat. The LED fixtures also performed as expected and when penetrating the same relative density produce lower light levels, also as expected. The spread of the LED fixtures was also not as great. This required either increasing the height above the specimen plants of adding additional fixtures. The LED fixtures also produced less heat and on a per unit basis used less energy. My conclusion is that while LED fixtures are not as effective a means of providing illumination as expected. In addition there is no valid single equivalency for LED vs HPS/MH. LEDs can easily replace lower wattage single source lamps for a single plant. However illuminating a larger area with numerous larger, denser plants equivalency can only be gained by using multiple fixtures. This then increases the complexity as well as energy consumption. Added to this is the loss of potentially useful heat. If the subject area requires additional energy to maintain appropriate heat and humidity control it will need to be augmented with additional heat sources. The growth rates of the plants were equal only when the LEDs illuminated significantly less square footage than would be expected assuming equivalency. The most mitigating factor is that I did not use any walls or reflective material around the plants. Given the nature of light I assumed that it would favor the HPS/MH by a large factor. My subsequent use of both styles of fixtures in grow tents has confirmed that suspicion. My testing was done using two 5 foot citrus trees, approximately 12 Contender bush bean plants, 6 Rosemary plants and a professional light meter. I cannot afford expensive test equipment and isn’t the actual plant growth the real result. Each cycle was one month and the bush beans were approximately 2 weeks old. I missed matching # of growing days before testing due to work. I know this is long and seemingly know it all. I have fourth years experience in studio and location lighting. I have worked with fixtures as large as 10k and as small as 15 watts. I have also used every imaginable type of lamp from carbon arc to the newer LED fixtures and the not so much older specific spectrum fluorescent lamps. If the moderator would like to remove this post and discuss this further off line please feel free to contact me.